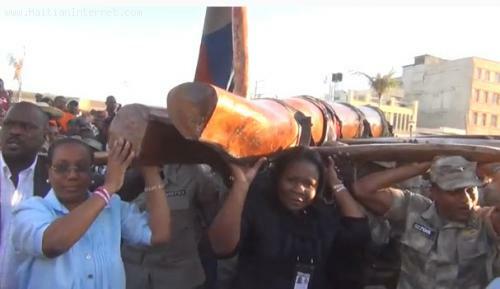 Haitian Police and authorities joined hands this morning to raise Kita Nago from the base of the Neg Mawon statue and carry it out of Port-au-Prince. Kita Nago continute it's journey, on Foot, from one Haitian Hand to another, from Les Irois to Ouanaminthe. Kita Nago should go/start from Haiti to the Americas and all Africa. I think that is an Emblem that will go throughout Haiti to remind Haitians that they have to put their head together, work together, love each other in order to put an end to that the curse: saying " Blacks hate their own people" we can see that throughoug African history and most Black organizations. French people have studied blacks and confirm that in their writtings. What exactly is Kita Nago? And why is it being removed from port-au-prince?